Peri Reed is trying to lie low and live a life off the grid. After discovering in The Drafter that the life she’d been leading was fabricated, Peri is in hiding from Bill, her ex Opti handler. Unfortunately, Bill has other plans for her. A drug has been created that would return all of the memories she’d lost. The catch is that she’d be hooked, and Bill could control her by providing her with the drug, Evocane. Her choice between re-discovering herself and becoming, essentially, a crack addict was actually a difficult one. 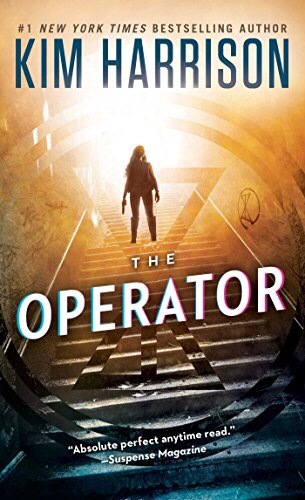 The Operator explores her relationship with the man she once loved but forgot, the man she loved who betrayed her and the boss she’d like to kill. With a couple other psychopaths thrown into the game. The Operator explored a bit more of Peri’s background. Silas, the man she loved and had wiped from her memory, is no longer content to watch things happen from the sidelines. In my opinion, he’s a big part of the success of this story. Without Silas, Peri would just be a caricature, an empty humanoid shell. The fact that she wants to remember their previous life together gives her the strength to fight for her freedom, and someone we can identify with and root for. Kim Harrison is the author of one of my favorite series (The Hollows) and I can’t help but compare Peri to that series female protagonist, Rachel Morgan. Peri and Rachel have a couple of things in common. They both have an inordinate amount of talent, they are a bit insecure, and their conscious comes in the form of a sidekick (Peri’s a hallucination of her ex partner and Rachel’s a pixie named Jenks). They both have a lot of honor, even though they may use bad judgement and extraordinary means to deliver the right outcome. When I pick up a book in either of their series, I know I am in for a wild ride. The Operator was definitely that!